Eclair is always looking for a handout. I can hear them as soon I open my car door; the barking and rooing (a combination of howling and singing that is the trademark of the breed) can be heard through the walls and carries across the parking lot. I have arrived for my turnout shift at Northern Greyhound Adoptions in St. Albans, Vermont. Walking to the entrance, I pass an iron and wood bench engraved with the name Donald Westover. Donald and his wife Dorothy founded the kennel in October of 2001. For years, he could be found spending his weekends introducing potential adopters to dogs and answering questions about life with sighthounds. His passion for the breed was evident: his enthusiasm was infectious, and many hounds found homes because Donald went the extra mile to make adopters feel comfortable – about the dogs and the adoption process. Those who met him remember Donald fondly. He was a big man with a big heart, and he continued to carry the torch for NGA even after being diagnosed with emphysema, often attending adoption events with an oxygen mask in tow. His first priority was always the dogs, that was never in question. He remained active with the non-profit as much as he could, even as his health deteriorated. He made it a priority to bring a greyhound and a donation bin to a local pet supply store every week. Now that he has passed, his devilish charm, his ‘hound companion, and most importantly his donation jar are absent. NGA is feeling his loss in many ways. They need your help and mine. I am here to let the ‘hounds out of their kennels, in groups, and by themselves for bathroom breaks. This is one of four daily chances for the retired racers to stretch their long legs and for their mini-apartments to be cleaned. While they frolic in the yard and take care of their doggy business, I check their impromptu dens and change their bedding when necessary. It’s a busy shift letting the forty-two dogs out and keeping the process steadily moving along. I know how cranky I would be if I was dependent on another being to allow me to go to the bathroom. The number of dogs in need of permanent homes swells at times, to as much as seventy. As tracks close all over the country adoption centers like this one must meet the demand of the increased number adoptable dogs. 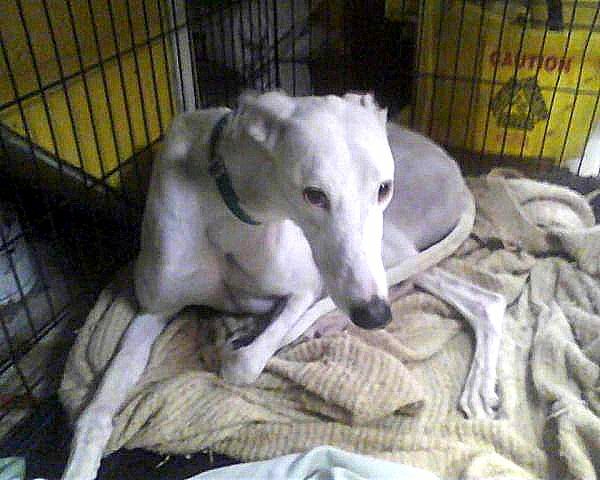 This humble kennel in northern Vermont has never turned away a greyhound in need. I have just added another function to my volunteer service; that of a member of the board of directors. A wise woman I know said everyone should sit on a non-profit board of directors. I am now privy to the financial aspect of the non-profit and often I wish I weren’t. The charity runs on the generosity of others, through donations and the other fundraising endeavors of the operation. The coffers are always low and the kennel seems to run on a month to month basis. Rent, utilities, and vet bills take their toll on the threadbare finances and I wonder if some catastrophe would push the charity to the breaking point. The weekend yard sale that lasts throughout the summer has ended, and the long cold winter approaches. The board has frequent meetings to discuss fund raising strategies in order to survive the cold months. The financial survival of the non-profit is a constant struggle. Mallow relaxes, but is always ready for action. I gain strength from the dogs. The mental burden of my role as a board member fades and my excitement rises as I take care of these beautiful animals. My worries and fears diminish as I look into the face of the first greyhound I let out of his apartment. I take a minute to scratch Mallow’s enthusiastic white face. I lean close and say to him, “I missed you, buddy.” He leaps out and runs around the kennel with wild abandon and I have no doubt he missed me too. 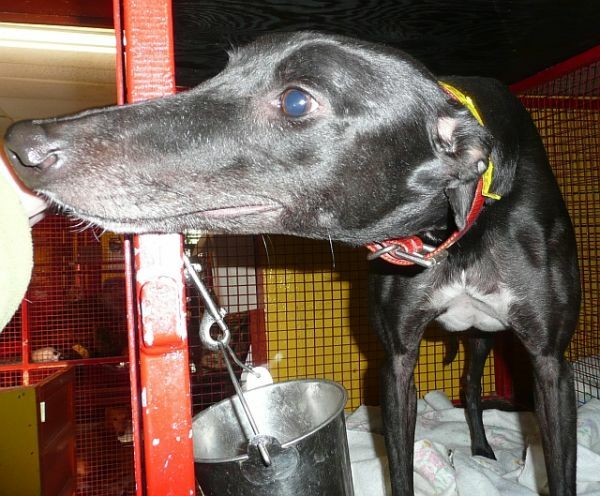 Donations can be sent to Northern Greyhound Adoptions, 999 Fairfax Road/Route 104, St. Albans, VT 05478 or online at http://www.Northerngreyhoundadoptions.org.